“Like Don Quixote roaming the Spanish countryside waging battles with windmills, we skiers go into the mountains chasing lines and performing our own acts of heroism. The Quixote pays homage to the dedication skiers have to something the rest of society may not understand or see, but to us is as real and important as anything." Praxis Skis and Drew Tabke have partnered yet again on a convention-bending ski concept, blending knowledge and technology gleaned from a decade of tireless design, experimentation and testing. The Quixote's defining design principle is offset taper, with left and right foot-specific ski outlines. While the sidecut arc/radius remains constant on both edges for a predictable carved turn, the tip and tail of the outside ski edge tapers earlier than the inside edge. While skiing, this creates a longer effective edge for the downhill ski compared to the uphill ski, a design that recognizes, and balances, the variable forces applied to each ski during a turn. The result is an incredibly balanced, two-footed platform for the rider, allowing for a more comfortable, powerful and fall-line approach to the mountain, perfectly tuned to take on any line you can imagine. Hardwood Core: Our maple, ash, paulownia core is used in the construction of the Quixote. These woods are blended together to offer the ideal weight, strength, and dampening properties. Offset Taper: The outside edges have a shorter effective edge length and longer tip and tail taper when compared to the inside edges. Specifically, the 188 Quixote has an outside edge sidecut length of 136 cm, tip taper of 27 cm and tail taper of 25 cm. 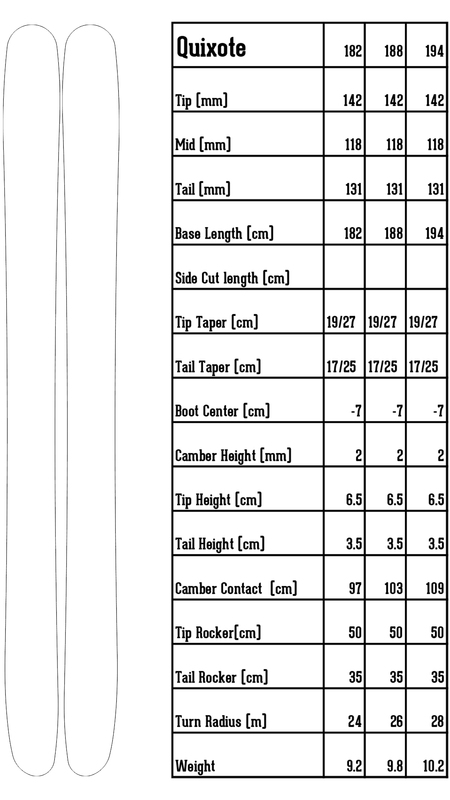 On the inside edge, sidecut length is 152 cm, tip taper of 19 cm and tail taper of 17 cm. Multidimensional Sidecut: This skis sidecut is not your dad’s old school, one trick pony, radial arc. Nope, these skis blend a variety of arcs, to create a geometry that will allow you to make turns on demand, when and where you need to with ease. The Quixote features an average turn radius of 26 meters. The sidecut radius is larger in the tail, and progressively grows smaller as you move up to the skis tip, and into the offset taper. Note the sidecut radius and geometry are the same on both the inside and outside edges of the ski. The inside edge simply extends out longer, both in the tip and tail, creating the "offset taper"
ShakaCore Vibe Dampening Technology: Another breakthrough revolution in the evolution of ski design: Shakacore Vibe Dampening Technology. “Only good vibes.” We guarantee the craftsmen in the factory are practicing mindfulness and deep breathing through their respirators while laying up every ski, imparting only good vibes into the ski cores, guaranteeing you a chilled-out, vibe-free ride. Additional Features: Non GMO, certified organic, gluten free, humanely raised, sustainable, locally harvested, green construction and of course SKIERCRAFTED! “Traditional ski design with symmetrical shape and an fixed-radius sidecut is based on the assumption that the ski is carving a perfect arc on a static plane, like an alpine racer might be able to do with razor-sharp edges on hard ice. But in practice, and in particular skiing off-piste, the ski is rarely carving a perfect turn. Instead, it is constantly going in and out of drifting, checking speed, carving and what is virtually an infinite combination of turn-types. Rather than only needing to put force directly downward into the ski’s edge for a carved turn like a racer, when skiing off-piste we are also experiencing lateral and torsional forces while changing between a variety of turn shapes and snow conditions. The idea of the Quixote is to balance these changing forces according to the specifics of skiers’ body mechanics. While turning, a skier’s downhill ski is capable of greater power and control than the uphill ski. On the Quixote, the downhill ski has a longer effective length across which to distribute these higher forces. The uphill ski, meanwhile, with relatively less leverage and power, engages an edge that has shorter effective length. The result is greater equilibrium in the forces traveling between the rider and the skis on each leg, letting the rider have balanced, two-footed stance. To explain the same concept in terms of tip/tail taper; the downhill ski (with the longer effective edge) has less tip/tail taper, which equates to more edge hold. The uphill ski (shorter effective edge) has more taper, meaning easier initiating and transitioning between turns, and fewer hang-ups when buttering or spinning of jumps.